We lost Jennifer in August of 2013, but her memory lives on in the artists and collectors she touched, and the powerful works she created. In 2015, Magic City Art Connection is proud to kick off a partnership with the Jennifer Harwell Commemorative Gift to further preserve Jennifer’s memory and spirit. This annual gift will spotlight the work of the festival’s featured poster artist. This year, artist Ramiro Gomez of Los Angeles has been awarded this honor, in addition to being chosen as the festival juror. Ramiro’s career is on the rise, and his work is receiving much notariety at international gallery shows like Expo Chicago at the Navy Pier. To learn more about Ramiro, visit his page at the Charlie James Gallery, or visit his page on our website. We look forward to lifting up many more artists through the Harwell Commemorative gift. 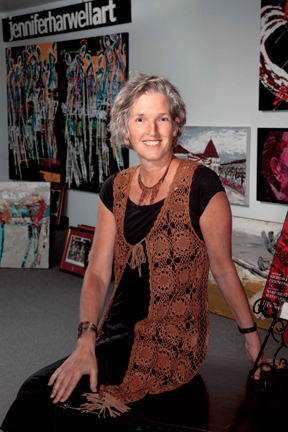 A special thank you to Jennifer’s family for partnering with Magic City Art Connection and its mission to continue to support the careers of artists around the country.